Oventrop may report a successful appearance at the world's largest trade fair “Bathroom experience, building services, energy and air-conditioning technologies and renewable energies” “ISH 2017”. allow for significant savings of energy with low investments. 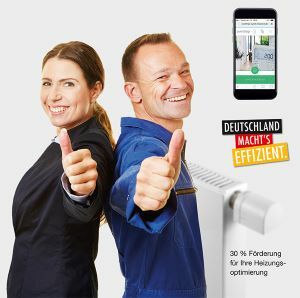 The “Q-Tech” technology for automatic hydronic balancing was presented for the optimisation of hydronic systems. All standard Oventrop valves are available with “Q-Tech”. The new system “OVbalance Home”, “the” smart way to hydronic balancing was developed from this. “OVbalance Home” consists of the system components “Q-Tech” valves, Oventrop wireless actuators and thermostats, the “Synet CR” gateway as well as the “Oventrop app” for easy commissioning and room temperature control. Installation is carried out in a few hours. Commissioning and operation are carried out via a tablet or a smartphone. which avoids a stagnation of hot and cold potable water in pipe sections with insufficient flow. major importance at the Oventrop booth. a ccompanies the “BIM” stages over the complete life of a building. BIM data are available in different formats, such as Revit and VDI3805. current calculation software for planning and design in the building technology at the Oventrop IT booth.